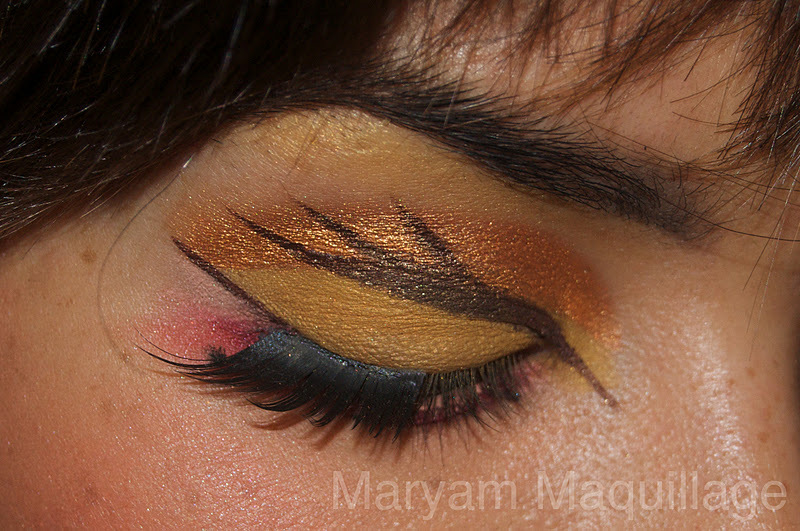 Maryam Maquillage: Lady Autumn for Pigments & Palettes!!! Lady Autumn for Pigments & Palettes!!! Read more for more pix!!! For the Pigments & Palettes Challenge, I wanted to do something a bit different from my usual wearable makeup looks and showcase my embodiment of Lady Autumn for the month of October (also my birth month)... I generally don't wear a lot of pumpkin colors, so I thought this was a perfect opportunity to branch out. For this look, I used mainly Coastal Scents eyeshadows from various palettes. I wanted the eye to be somewhat abstract (somewhat literal), hinting a leaf, a branch or a bird. For the art portion, I used Clinique cream liner in Black Honey (a lovely shimmery brown) and my falsies are accent lashes by Kiss. so much fun, love the fall colors, gorgeous! This is beautiful, love your blog! LOVE this it's very creative! :] and great interview!! Congratulations, gorgeous!!! I love her blog, and she's such a big sweetheart! HOT look, very dramatic!! I love the wings on the eyes! ;) And as usual--THE BEWB SHOT IS MUCH APPRECIATED. thank you soooo much everyone!!! Proud of u hunny bunny. Good work.. muahz. You look great. I think blogger ate my comment! Anyway, I was trying to tell you how awesome your fall colours look is! I loved your interview on Pigments and Palettes!